Want to learn how to make the warp-free basketweave tent needlepoint stitch like a professional? This tutorial offers everything you need to know to properly work the last of the three traditional tent needlepoint stitches. Even if you’ve never tried the basketweave stitch before, with just a little practice, you can master it and start creating needlepoint that looks like an expert stitched it. For extremely strong finished needlepoint that does not stretch out of shape, basketweave is the most used and preferred of the hundreds of stitches available to needlepointers. 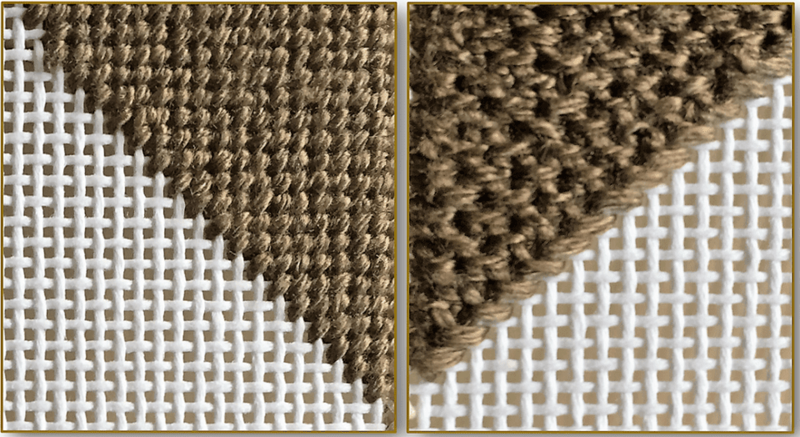 Although it's a slanted stitch that looks just like the half-cross and continental tent needlepoint stitches on the front of the canvas (see the left image above); the way it is worked with staggered alternating diagonal rows, creates a woven basket pattern on the wrong side of the canvas (right image above) that holds the mesh threads in place—virtually guaranteeing that the canvas will keep its original shape. This popular tent stitch gets its name from the interlocking “basket-like” pattern, making it very versatile. If you do needlepoint on a fairly regular basis, you've probably used one of its variations, the “reverse basketweave stitch,” in a project or two. It is worked simply with the woven side on the front and the regular tent stitch pattern on the back of the canvas. Step-by-step instructions and stitch diagrams are given separately for right and left-handed needlepointers. This eliminates confusion when trying to learn how to get and keep an easy comfortable rhythm when working the stitch. The basketweave stitch is ideal for working large background fill areas where there’s a chance that the canvas will be distorted if another slanted diagonal stitch is used. Stitched alternately in rows, it is worked first diagonally down the canvas and then diagonally up the canvas. Unlike the continental stitch, it can be worked back and forth without turning the canvas. You will need to closely follow the right-handed stitch diagram above to learn how to correctly make the basketweave stitch. Start by making two vertical continental stitches in the top right corner of the canvas, coming up at (1) and going down at (2), and then up at (3) and down again at (4). Notice that the next stitch will be placed to the left of the first stitch, coming up at (5) and going down at (6). You have now established a corner from which you can start working a regular diagonal row by coming up at (7) and going down at (8) and continuing down the row, ending at (12). The stitch for the next diagonal row is placed under the last stitch of the previous row, and starts the upwards direction again by coming up at (13) and going down at (14). Continue working diagonal rows up and down until the design area has been filled, remembering that upward-direction rows start with a vertical slanted stitch under the previous end-of-row stitch; and downward-direction rows begin with a horizontal slanted continental stitch. The easiest thing to keep in mind for left-handed stitchers learning to work the basketweave technique is that all the stitches slant in the same direction; and the rows are worked diagonally ONLY, not horizontally or vertically like with other tent stitches. Armed with this reminder, you can stitch basketweave rows forever, if needed, no matter that you are left-handed. With many needlepoint stitches, left-handed needlepointers can reverse right-handed working directions and achieve the same effect on canvas; but with the basketweave tent needlepoint stitch, this is difficult to do. These step-by-step instructions along with the left-handed stitch diagram shown above will remove this difficulty. Once you’ve mastered the stitch, you will be amazed at how professional it makes your needlepoint look. Make your first stitch in the lower left-hand corner of the canvas design area by coming up at (1) and going down at (2). Move two canvas mesh to the right and come up at (3) and down at (4). To establish the corner for forming the diagonal stitching rows, come up at (5) and go down at (6), placing the slanted stitch above the first one you made. Work the next stitch from (7) to (8), and finish the row in a downward direction until you complete from (11) to (12). Stitch (13) to (14) to begin an upward-direction diagonal row. Continue working until your stitching falls into an even rhythm. You’ll be surprised at how quickly this begins to happen. Use enough strands of needlepoint thread in the tapestry needle to completely cover the canvas, but not so thick that you have difficulty working the needle in and out of the canvas mesh. Threads that are too thick will push the canvas mesh out of shape. Always try to completely finish a row and place the first stitch of the next diagonal row before stopping your work to do other things. This will mark your place and let you know where to resume your work. If you must give in to a distraction and stop in the middle of a row, leave the tapestry needle pointing in the direction you were working to keep from breaking the stitching sequence and creating an unsightly diagonal ridge in your needlepoint. Another way to tell which direction to take is to look on the wrong side of the needlepoint canvas. If the last stitched row is horizontal, then your next row should be worked in the downward direction; if vertical, the next row should be stitched in the upward direction.